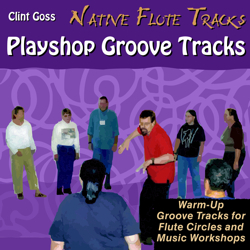 Groove and support tracks designed for use by facilitators and leaders of flute circles and music workshops. This CD contains eight tracks that support group warmups and basic music exercises and activities. Ordering information: This CD is available now! Reviews: on the Reviews Page. ©2009 Manifest Spirit Records, 8 tracks, MSR-NT20. This player has excerpts from the first three tracks on this CD ... and gives a feel for the styles of background tracks that take you through a movement warmup, rhythm, vocalizations, short solos between drumbeats, and vocal toning. The basic outline begins with the track 1 that covers activities A, B, and C above. When you wishes to proceed on to engaging the participants in short solos (activity D), you switch to track 2. This track provides a drum rhythm that leaves space for a short (one bar) solo by each participant. When you wish to proceed to vocal toning (activity E), simply switch to track 3. If you do not wish to engage the participants in short solos, you can proceed directly from activity C to activity E by switching from track 1 to track 4. Tracks 5 through 8 are structured exactly like tracks 1 through 4, but have a different set of sounds and a slightly different feel. Tracks 1 through 4 are done in G and D (G major or minor) and tracks 5 through 8 are done in A and E (A minor, predominantly). The details of the outlines described above are available in this document in PDF format.